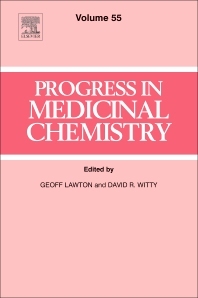 Progress in Medicinal Chemistry provides a review of eclectic developments in medicinal chemistry. This volume includes chapters covering recent advances in cancer therapeutics, fluorine in medicinal chemistry, a perspective on the next generation of antibacterial agents derived by manipulation of natural products, a new era for Chagas Disease drug discovery? and imaging in drug development. Dr Geoff Lawton has extensive experience in new medicine discovery across many therapeutic areas in both large and small companies and is a co-inventor of a marketed drug (Cilazapril). He is a former Director of Chemistry at Roche UK, and Vice-president Chemistry and Preclinical Sciences within Roche Bioscience, Palo Alto, USA. He was for five years the research member of a global therapy area strategy planning team for inflammatory diseases, aligning research with the clinical development and marketing parts of the business. From 2003 to 2007 he was founding Research Director with Lectus Therapeutics building from start-up a drug discovery organisation; generating the team, facilities and project portfolio targeting the next generation of ion channel modulating medicines. Since 2001 Geoff has provided scientific and strategic evaluation and advice on drug discovery as an independent consultant for a number small and medium sized biotech companies, CROs, VCs, academic groups and medical research charities. Geoff serves on the Board of Antabio, a French biotech company developing tomorrow’s antibacterial drugs. He is a founder of INMedD, a new medicines discovery social enterprise. Dr David Witty has more than 20 years experience in the pharmaceutical industry as a medicinal chemist and project leader working principally in areas of anti-infectives, metabolic diseases, cognition and pain, delivering clinical candidates for several conditions. He led IT Strategy within the Neurology division of GSK, developing and deploying the first Electronic Notebooks for drug discovery to sites in the UK and Singapore. He has contributed more than 90 scientific papers, reviews, patents and books on medicinal and synthetic chemistry. In 2010 David and several colleagues successfully raised $35M in venture funding to found Convergence Pharmaceuticals, a specialist ion channel company focused on the development of novel treatments for pain, based in Cambridge UK. David presently leads their discovery programme and manages scientific operations within the business. David is chairman of the Fine Chemicals Group of the Society of Chemical Industry, with responsibility for the delivery of conferences, seminars and training courses for chemists throughout the UK and Europe, and advising parliamentary bodies on matters of relevance to the UK chemical industry. Since 2008 David has been a STEM ambassador for SETPOINT, introducing school students at both primary and secondary level to the excitement and possibilities of pursuing scientific careers, through workshops, lectures and competitions.